Our time in Cambodia was different from every other place that God has taken us to, as has been the pattern of our journey thus far. One of the things that remain the same is that God never fails to bring about God appointments where ever we go. 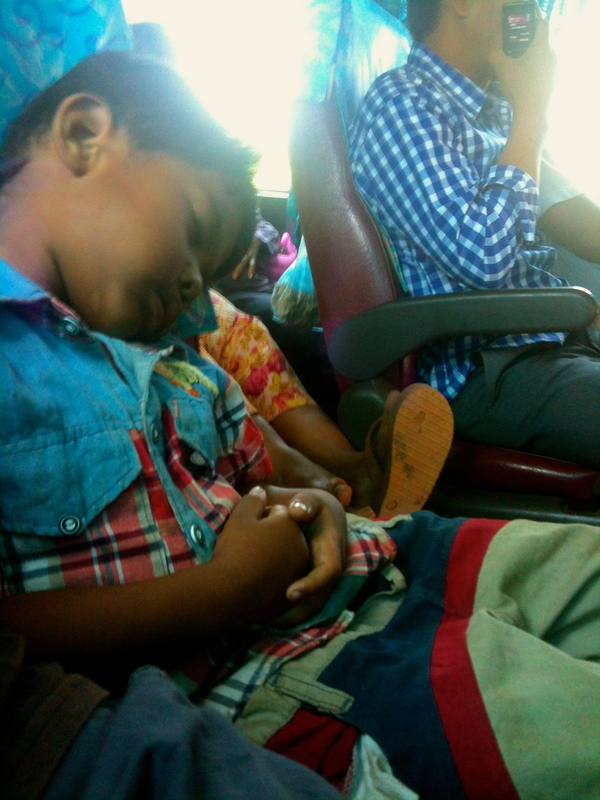 This little guy decided to join me on the bus and fell asleep on me. Last Saturday, Jeremiah and I went to an internet cafe for breakfast so we could do some work. Soon after ordering drinks, the electricity went off and we found ourselves in the presence of a woman trying to get us to buy cookies to benefit the children of Cambodia. Jeremiah asked her what they do for the children and she said that they do a reading program. Jeremiah responded, saying that we believe unless you are helping them spiritually as well, you are not really helping them at all. She said that they do help them spiritually, that they too were Christians. She then invited us to her church for service on Sunday morning. Later on that evening, Jeremiah said that he felt that there was an open door with this woman and we would go to her church. Though no one on the base had heard of this church, we made a deal that we would try and find it and if not, we would have church together. After a little trouble finding the church (It was not at Omega Hotel, but at Alpha Hotel…perhaps we should have started at the beginning and not the end,) we arrived at the small gathering of people all dressed in the same white clothing. Their church service consisted of watching and partaking in a pre-taped service from the Philippines, at their home church. It did not take long for us to realize that this was no ordinary church service, but it was in fact, a cult that we had been invited to. There were so many red flags within the first 10 minutes and throughout the 3 hour service. During the service, I asked Jeremiah several times about leaving, but he said he felt there was someone to talk to. The pastor of the church essentially spoke a message of repentance, through instilling fear that without repenting, horrible things would occur. That you must repent and your life has to be completely given over to the Father and King, and live accordingly to the will of the Father. He also spoke primarily on God’s love, reading all of 1 Corinthians 13. Through many things, this man had now become the “Appointed Son of God”; basically, Jesus had not finished the work. Jesus came for the Jews, but God had appointed him to come for the Gentiles. After the service, the leader of the church tried to get us to come to a meeting to hear more but he would not share the beliefs, saying that it was too complicated. The Truth is, what Jesus preached was not complicated. It is simple and made for everyone to understand. God sent us there to speak Truth where there was deception. No, we did not see a change immediately, but planting Truth will always win out in the end, because Jesus is The Way, THE TRUTH, and The Life. The problem with this cult and many others is that the people heard the message one man was given through spoken word, dreams and visions, and they followed him. There was no Bible there during his time of receiving this. The Bible says ‘the enemy disguises himself as an angel of light’ (2 Cor. 11:14). Paul warns us over and over again in Romans to beware of false prophets and teachers. Though this man taught from Scripture, he was not teaching the whole Bible and from the Lord, thus leading 6 million people astray. The point of this always got me. 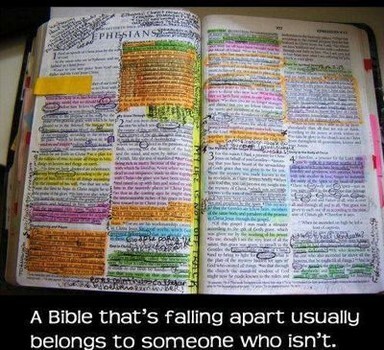 Joshua 1:8 instructs us to “Study this Book of Instruction continually. 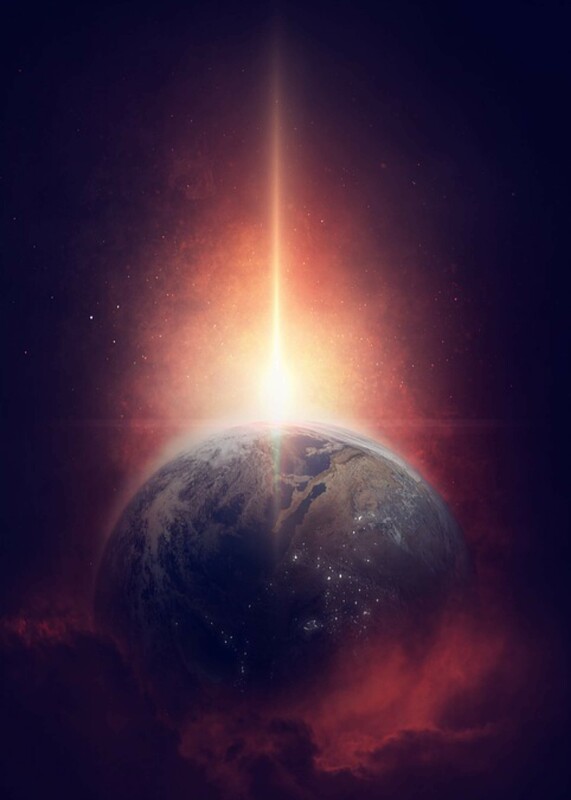 Meditate on it day and night so you will be sure to obey everything written in it. Only then will you prosper and succeed in all you do.” We must study and know the Bible by spending time with God and receiving revelation from Him. Then when the enemy comes, we will be able to recognize it and bring to light what is moving in the darkness. Have you given yourself wholly to studying the Word and receiving all the God wants to give you through it? Are you familiar with the Truth and able to discern when something is not Biblical? If not, I urge you to learn the Truth; and the best way to do this is by spending time with Jesus and reading His Word and receive the life and joy that comes from this devotion!!! This entry was posted in Cambodia, Katie and tagged 1 Corinthians 13, 2 Corinthians, Alpha, Angel, Appointed, Appointment, Belief, Bible, Book, Breakfast, Cafe, Cambodia, children, Christ, Christians, church, Cookies, Cult, Darkness, Deception, Dreams, Drinks, enemy, gathering, Gentiles, Gibsons, Gibsons Go Global, God, Holy Spirit, Hotel, Internet, Jeremiah, Jesus, Jews, Joshua, Katie, life, Light, Lord, love, meditate, Meeting, message, Obey, Omega, pastor, Paul, Phiippines, Pray, prophet, Prosper, Reading, Repentance, Romans, Saturday, scripture, Service, Son of God, spiritual, teacher, Team, Truth, Visions, Way, Woman, Word, work, Youth With A Mission, ywam on May 10, 2014 by gibsonsgoglobal. Yesterday we went on our first house visit here in India. Jeremiah and I joined some of the World Race girls that were going to visit Pastor James at his home/church in the slums. When we arrived there, we were very much welcomed. The Pastor’s wife began making chai tea (as is usual and much to Jeremiah’s delight) for us and gave us cookies to eat with them. We were greeted many times by new people that were coming in the room, many were family but many were people who had been with them and been told we were coming. After Pastor Daniel translated for us the family’s testimony and how they had come there, they sang some worship songs in their language; and the pastor’s son, who is a composer, played the piano with them. When they had finished their songs, they asked us to sing. Prior to this day, I had made mention to the people on the team in a conversation that I am a person of all worship and if you want it, I probably have it. So upon being questioned this, every person seated against the wall, one by one, went down the line looking for someone to lead the worship until all eyes were on me; since none of them were musically gifted. Possessing the secret knowledge that I taught myself to play the guitar many years ago, and once played in the youth band at church, but have not played in almost two years, I find that all reliance is upon me to share the joys of American worship with these intrigued people. Since there was only a keyboard there, of which I taught myself chords over one year ago but have no idea how to make it sound pretty, I decided that I would let the gifted ones lead worship by playing some songs from my phone. After worshipping a little bit, we were offered more chai and biscuits according to the Indian hospitality. Very quickly, we transitioned into prayer time. We learned that soon the government will come and bulldoze all of the land in the area and build on it. The homes that are there have been built on government soil so they are choosing to displace 500 families to attain their desire for expansion. Pastor James, his family, and the people there are among those being displaced and will soon have no place to go. Believing that God is a God who answers prayer, we began praying for he and his wife and children. He has dedicated his life to serving the Lord and helping others come into relationship with Him. After praying and laying hands on them, I saw that the room was full of people wanting prayer. One by one, people and families were coming forward desiring prayer. Jeremiah had told me in the past that here, people are hungry for prayer; and you really are there until you have laid hands on and prayed for every person. It did not seem as real to me until that moment. Pastor James kept calling people from other rooms to come in for prayer and they kept coming. He called in his son’s wife, Rebekah to come and told us that she and his son have been trying to have children for 4 years with no change, and they want prayer that God would see their desire and reward them. When laying hands on Rebekah and praying for her, I became very overwhelmed with the Spirit and the Father’s heart, to tears. The Lord really touched my heart in praying for her and I truly believe that the reward of new life will be brought to them. My heart melted when Pastor James asked another woman to come from one of the rooms. She came out holding her newborn, 15 day old, baby girl. She stood in front of me and handed me her daughter. She wanted prayer for herself and her baby girl that they would have good health and blessings. From the moment she placed that precious girl into my arms, whatever the Lord had begun doing in me in praying for Rebekah, He just broke me down. I have never felt so broken when praying over someone before, and I could not contain the tears and sobbing over this beautiful baby. 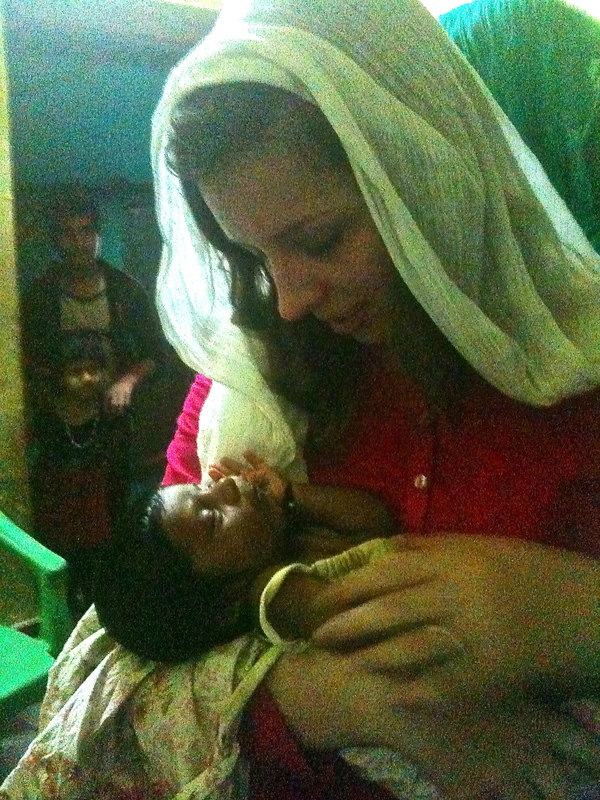 She had the markings that the doctors or people place on newborns’ heads and hands, marking them for hinduism. The enemy through that is trying to lay claim to this precious life, but in Jesus name, she belongs to the Lord. My greatest prayer for her more than health was that the Lord’s hand would be upon her so richly that she would never know a day of her life where He was not with her and Lord over all in her life. When we finished praying for everyone, we had to be dragged out of there to leave because we were so engulfed by the people. Some followed us outside and one of the elderly gentlemen wanted prayer for the pain in his leg, so Jeremiah and I prayed for him. Indians passing by in the street were flocking to Jeremiah and I shaking our hands, wanting pictures, and talking to us. I realized when looking back at this all, what it must have been like when Jesus went to villages and vast crowds followed Him, even if it meant searching everywhere until they found Him. On the way back to the house, I was so undone over what the Lord had done in my heart in being in an area where there was nothing but desperation in the people, that I cried the whole way back. The words that kept scrolling through my minds was how the Bible says over and over again that ‘Jesus was moved to compassion’, ‘Jesus wept’, ‘Jesus felt sorry for them’, ‘Jesus was amazed.’ I see now that this is the lifestyle that He lived, and the lifestyle He calls each one of His believers to follow, a life of brokenness for His people. I truly know now how I am to live the rest of my life, moved to compassion and ever-increasing brokenness. The Apostle Paul said that ‘the love of Christ compelled him to go places he never thought he would go and to do things he never thought he would do’. Has the love of Christ touched your heart to the degree that you would count the cost and live a life of radical abandonment, being a laid-down lover for Jesus? Would you be willing to leave everything behind, when He calls you, and to follow Jesus wherever He takes you and to whomever He brings you? This was the life of Jesus’ disciples, and if we are true followers of Him, our lives can be no different! This entry was posted in India, Katie and tagged Baby, Chai, church, Compassion, Cookies, Daniel, Disciple, Follower, Gibson, Girl, Global, God, healing, heart, Hinduism, India, James, Jeremiah, Jesus, Katie, Lord, Ministry, Music, pastor, Paul, Pray, Prayer, Rebekah, Revival, Slum, Tea, The Apostle Paul, Wept, worship on March 10, 2014 by gibsonsgoglobal.